To finish off this short series about the Digital Architecture framework, let’s take a look at what we can learn and infer by looking across, and up and down, the quadrants. 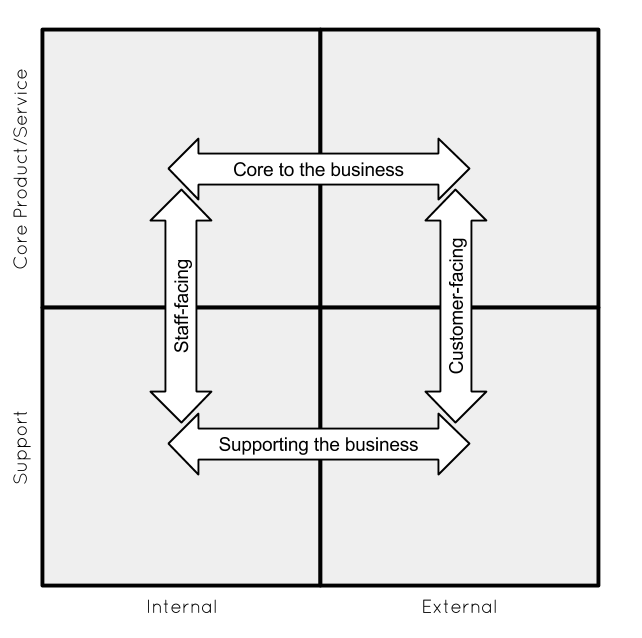 The functions and services that span across the top two quadrants are the way in which businesses differentiate themselves (unless, of course, you are doing it predominantly on price, in which case as we’ll see the bottom two boxes become more important because they’re all about margin). If you are defining your business apart from others, these are the areas in which you are mostly likely to see technology that is unique in its construction. This has its pitfalls – build too much technology (particularly when it’s internally-focused) and you run the risk of locking yourself into certain ways of working that reduces your business’ nimbleness and ability to react. But buy products (particularly “industry solutions”) and you might find yourself stuck with legacy of both tech and business process that does you no favours either. I was talking a few days ago to someone who works in the housing industry – working for a housing association that provides homes to rent. In that industry, where there’s no hard competitive need to differentiate oneself from competitors quite in the way firms working in more open markets might, but you still definitely have core business activities, it’s quite common to find very well established software providers. My contact reckoned that the handful of players in the Housing Management software market are years from providing software that fits in the modern world of Web, apps and cloud. That will start to become a problem when customers demand more digitally-enabled services (or when cost pressures determine the need to make things more digitally self-service). The modern world of Cloud infrastructure means that there are now better opportunities for businesses to build and experiment. But as we will see its easier in the right-hand column than the left hand. Internal systems, the left-hand column, is the traditional realm of IT. It’s also the realm of process-centric systems in which a production-line approach is generally taken to reduce ambiguity and promote repeatability (and increased efficiency and effectiveness through that predictability as a result). This approach reduces risk in the short term, but (as Taleb argues) makes things very fragile. If something happens outside of the boundaries of the expected, things break down. The right-hand column is, I would argue, more ambiguous. In both cases it’s because the providers of the services have no control over the ways in which the users may use systems: LinkedIn or Facebook or Amazon may try to encourage how people use their services, but ultimately they have no means of sanction to force use (an idea which, almost certainly misguidedly, underpins much of the way in which internal systems have been built over the years). In the Comms quadrant (bottom right) this leads to remarkably anti-fragile services because individuals make sense of how to use them for themselves. Interestingly, the right hand column appears to be the place where emerging Chief Digital Officers are focused. I’m unsure about how long those types of roles will be around. Where are pressure points going to be found? Well, as is ever the case, usually where the joins are. Where customer experiences on external functions hit the realities of internal processes and systems – either in the core business or on supporting functions. In fact, social networks in particular, I believe on this analysis are going to be very tricky to manage because they don’t sit well in the much more process-centric processing of customer service in particular. Where Twitter and Facebook meet the call centre, there’s a lot of jarring. This framework doesn’t give any magic answers, but what it can do it quickly segment a set of functions and services to identify challenges, gaps, and opportunities. In the coming months I’ll report back on its application.